Nintendo's presentation kicks off with Pokemon X and Y for the 3DS, due for release on October 12 this year. Featuring the new Fairy-type Pokemon which is effective against Dragon types, the game will also have a "Pokemon-amie" feature where you can feed, pet and play with your Pokemon to strengthen bonds.?trailer??website? Super Mario 3D World is unveiled, due out this December. The game will have up to four players control Mario, Luigi, Peach and Toad (nice throwback to Super Mario Bros. 2) and feature new powerups such as the cat suit, allowing characters to scale walls and slash enemies with their claws.?trailer? Heading for the WiiU soon is Mariokart 8, the latest in the hugely popular franchise. Set for release in Spring 2014, we'll be seeing features such as motorbikes and underwater races returning as well as new features such as anti-gravitational courses where you can drift your cart along vertical tracks or even upside-down.?trailer??website? Mario Party for WiiU was shown featuring the usual assortment of mini-games that make full use of the console's control setup, even including two-player games that can be played with just a single tablet. The previous release date of Summer 2013 has been bumped up to a currently undisclosed time this year as the developers would like to make the game as enjoyable as possible. Following on from one delay, we get another - Wii Fit U will need additional time to develop and will be released in Spring 2013. A new installment of Art Academy is currently in the works, which sets to give users more complete drawings tools (such as different types of pencils, pastels, etc). Additional details to come later. Another montage of smaller games and indie titles being released via the Nintendo eShop, such as Ballpoint Universe, Cloudberry Kingdom, Coaster Crazy Deluxe, DuckTales: Remastered, Dungeons & Dragons: Chronicles of Mystara, Mutant Mudds Deluxe, Oddworld: New 'N' Tasty, Scram Kitty & His Buddy on Rails, Shovel Knight, Spin the Bottle: Bumpie's Party and A World of Keflings. The Legend of Zelda: Wind Waker is receiving the HD treatment for the WiiU, featuring enhanced shaders and graphics that will run at 1080p. The Tingle Tuner will return in an updated form, and players can take screenshots and upload them to the Miiverse via a "message in a bottle" mechanic.?trailer??website? Platinum Games' The Wonderful 101 receives an August 23 release date! Assemble a group of heroes to create massive weapons of awesomeness using the WiiU touchpad.?trailer??website? Donkey Kong Country: Tropical Freeze is in development and will be released later on this year. In this installment, the DK Island has been overrun by vikings and you must set out to undo the damage done either in single-player or two-player co-op with either Diddy or Dixie Kong.?trailer??website? More Platinum goodness! A new trailer for Bayonetta 2 is shown featuring the now short-haired protagonist involved in all kinds of insanely stylized combat.?trailer??website? Details of a currently unnamed title from Monolithsoft set in the Xeno* universe were released. Further details to come, though what's been confirmed is that it'll be a JRPG set in a sci-fi setting that will allow the player to control large mechs at certain points, and some scenes also indicated some form of multiplayer.?trailer? The last one for the show is Super Smash Bros! 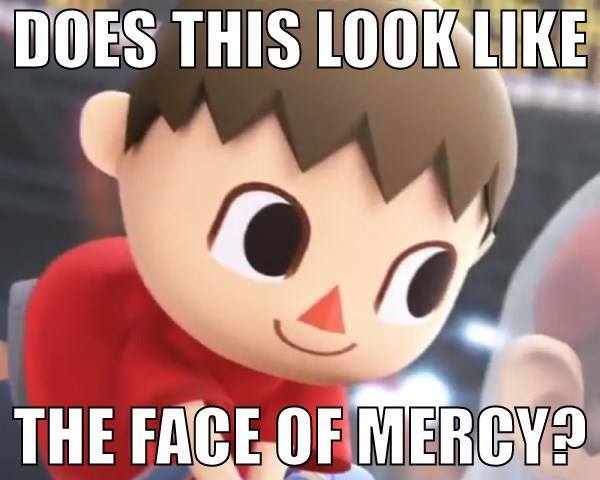 Heading for the WiiU and 3DS, we'll see all series staples return including Villager from Animal Crossing and... Megaman?!?trailer? ?website?